Warren Gatland's opinions regarding Ireland's lack of width in attack are unpopular, but true, according to George Hook. Ireland were convincing winners in Wembley yesterday, running in five tries against a flat Romanian side, still suffering from their gruelling midweek test against the French. Strong performances from Keith Earls, Simon Zebo, and Chris Henry showed the strength in depth that Schmidt possesses, however, speaking to Independent.ie, George Hook said that he believes that we are far too narrow in attack. "An international rugby pitch is 70 metres wide, we played the game inside the 15 metre line, which effectively means we played the game in forty metres". Hook's criticism echoes Warren Gatland's comments back in August, when after his side overcame Schmidt's, he said Ireland play successful but negative, narrow rugby. Against England in Twickenham, Wales looked to move quick ball out to the flanks, eventually overcoming Stuart Lancaster's men in what was surely the most exciting game of the Rugby World Cup to date. 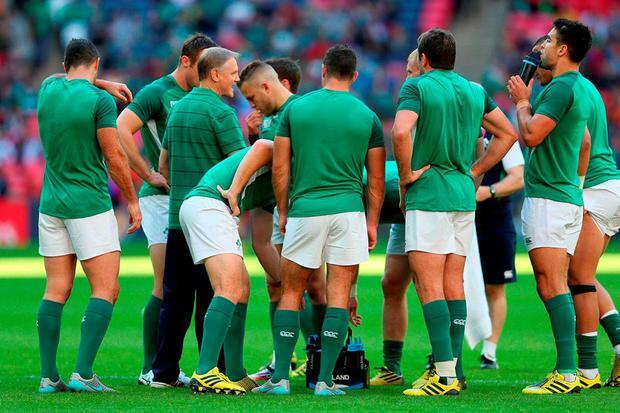 When Ireland come up against the stronger teams, Hook believes that we have to start making use of the whole pitch. "The few occasions we took the ball wide, the wings scored or somebody else scored"
"It's instructive to watch Wales and England, how they constantly strive to use the full width of the pitch"
With the huge talent in Ireland's first and second choice back three, the options are there to play a more expansive game, however, Ireland's attacking style is endemic of a wider issue with the game says Hook. "Whats be-deviling rugby union is the amount of defenders on the pitch, in order to create space you need to use the whole pitch".